Amla - Bhringaraj tail is one of the best remedies for hair treatment in Ayurveda. This oil contains components known for their effectiveness in treating hair loss, premature graying and oily. Also, this is an excellent means to care for the hair: nourishes the hair roots and makes them more dense and obedient, gives a natural glow. Amla - eclipta Alba tail returns hair to its original color, making them lush, eliminates gray hair, stimulates hair growth. It soothes the mind, reducing its excessive activity, promotes sound sleep, treats seborrhea. Indications: premature graying, baldness, alopecia, seborrhea, itchy scalp, anxiety, insomnia. Content: amla, bhringaraj, mandoor, haritaki, vibhitaki, anantmool, till tail. Application: rub the warm oil into the hair roots, leave for 20-30 minutes and rinse with warm water, for best results you can leave on last night and this morning to wash my hair. This procedure should be performed 1-2 times per week for 2-3 months. Original name: Amla - Bhringaraj tail Amrit Veda. 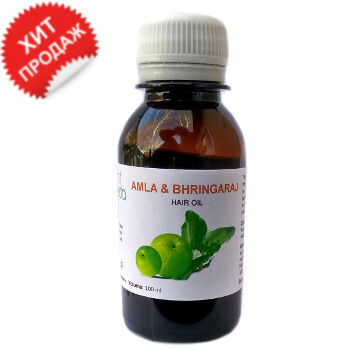 In our store You can buy authentic Amla - Bhringaraj tail Amrit Veda at the best price!